You’ve got to LOVE a couple who starts dating in high school and throughout all of the ups, downs and changes of college and early careers, is stronger than ever. 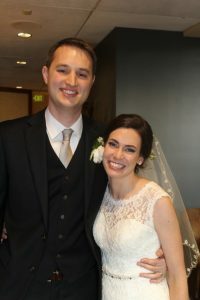 Congratulations to Stephen and Madeline, married on April 8th at the lovely Cedarbrook Lodge in SeaTac. Over a number of months, we worked together to craft a most personalized wedding ceremony that not only celebrated Stephen and Madeline’s path to their wedding day but one that poignantly honored their parents, families and friends. When I arrived about an hour before ceremony, and needed extra help with ceremony elements, I was very touched with Stephen and Madeline’s wedding party – the women were ‘on it’ and the guys were hugely helpful as they stood by to move large pieces around the space space (I’m into symmetry!). And with great love, we all shared in a ceremony that was deeply moving and one that seemed to go by way too fast. Stephen and Madeline…I hope you had a most amazing honeymoon in Hawaii and I wish you a lifetime of Aloha!